FERC Approves Two MOD Standards May 1 - FERC approved two new Modeling, Data, and Analysis (MOD) standards, which NERC had filed in February 2014. MOD-032-1 consolidates existing standards MOD-010 through MOD-015, and requires data submission by data owners to planners and planning coordinators to support interconnection studies. MOD-033-1 requires all planning coordinators to implement a document process to perform model validation within their planning area. MOD-032-1 will be effective on July 1, 2015, and MOD-033-1 will be effective on July 1, 2017. FERC Holds Technical Conference on New CIP v5 Update to Cybersecurity Reliability Standards April 29 - FERC hosted a technical conference to discuss cybersecurity impacts on electric reliability in the context of the agency's recently-approved Critical Infrastructure Protection Version 5 (CIP v5) reliability standards. The technical conference addressed the adequacy of proposed CIP v5 standards for protecting bulk power system communication networks, the need for additional cybersecurity controls, and differences between the CIP v5 standards and NIST's recently issued cybersecurity framework. FERC is accepting comments on the technical conference until May 21st. To submit comments or review the agenda and presentations, click here. President Obama Re-nominates FERC Commissioner LaFleur - May 1 - President Barack Obama announced his intent to re-nominate FERC Commissioner Cheryl LaFleur. In response, Commissioner LaFleur issued a statement expressing her gratitude for being re-nominated and indicated that, if confirmed, she looked "forward to continuing to work with the wonderful team at FERC on the important energy issues facing our nation." Colette D. Honorable, the President of the National Association of Regulatory Utility Commissioners ("NARUC"), also issued a statement in support of Commissioner LaFleur's re-nomination. In her statement, NARUC's President expressed her appreciation of Commissioner LaFleur's leadership and engagement with NARUC over the past year. FERC Denies EEI Request for Rehearing in Peak Reliability Proceeding - April 23 - FERC denied Edison Electric Institute's (EEI) request for rehearing of FERC's February 12, 2014 order accepting NERC and WECC compliance filings related to the establishment of Peak Reliability, the WECC reliability coordinator. Among other things, EEI argued that Peak Reliability is ineligible to receive funding under Section 215 of the Federal Power Act, and that the reliability coordinator and interchange authority functions are not statutory. FERC Requests Comments on Revised Definition of the Bulk Electric System ("BES") April 18 - FERC has requested comments on the revised definition of the BES developed by NERC in response to FERC Order Nos. 773 and 773-A. Specifically, in the revised definition of the BES approved by FERC, NERC revised exclusion E1 to note that the presence of a contiguous loop, which is operating at a voltage level of 50 kV or less and between configurations considered radial, does not affect the E1 exclusion. In its request for comments, FERC estimates that this will result in a decreased burden on filing parties and seeks comments on whether: 1) this information is necessary for the proper performance of the Commission; 2) the accuracy of FERC's estimation of the burden and cost associated with collecting this information; 3) ways to enhance the quality, utility, and clarity of the information collection; and 4) ways to minimize the burden of the collection of information on those who will respond. Comments are due on May 27th. Rehearing Granted in WECC Delegation Case April 14 - FERC granted limited rehearing for further consideration of its decision to approve the delegation agreement between WECC and Peak Reliability. 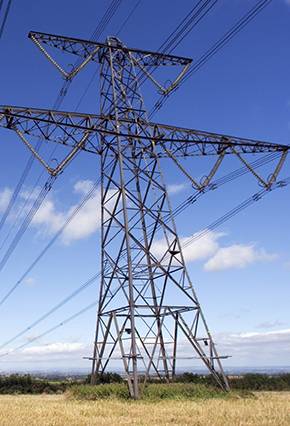 FERC Announces BPS Technical Conference for June April 16 - FERC has scheduled a Commissioner-led conference "to discuss policy issues related to the reliability of the Bulk-Power System" for June 10, 2014. The conference will be open to the public. An agenda has not yet been posted. Expedited Physical Security Standards Development Process Moves Forward - On April 24, a 15-day formal comment and concurrent 5-day initial ballot period and non-binding poll closed in Project 2014-04, concerning Physical Security standards. The NERC Standards Committee authorized a waiver permitting the shortened comment period and concurrent ballot period to comply with FERC's directive to file a physical security reliability standard with FERC by June 5, 2014. Slides from an April 17 webinar on Project 2014-04 are available here. April NERC Enforcement Filings April 30 - NERC filed with FERC a Spreadsheet Notice of Penalty detailing 31 violations of 11 standards by 12 entities, as well as one separately docketed enforcement proceeding. Separately, FERC declined to review three enforcement filings from March, but opted to keep one matter open for consideration through June 29, 2014. NERC Submits Comments in Support of Notice of Proposed Rulemaking ("NOPR") for Generator and Transmission Relay Loadability Standards April 21 - NERC submitted comments in support of FERC's NOPR, wherein FERC is proposing to approve reliability standards PRC-025-1 and PRC-023-3. These proposed reliability standards address Generator Relay and Transmission Relay Loadability standards, respectively. Subsequent Measures Taken on Penalties April 17 - NERC filed supplemental information on a March penalty assessment approving a settlement between NPCC and WECC, and indicated that in considering penalty costs the only factors considered were costs necessary to comply with reliability standards. Comments Filed on Geomagnetic Disturbance NOPR - Stakeholders filed comments in response to FERC's January 16, 2014 Notice of Proposed Rulemaking (NOPR) proposing to approve Reliability Standard EOP-010-1 – Geomagnetic Disturbance Operations (GMD). NERC, EEI, the U.S. Chamber of Commerce's Institute for 21st Century Energy, and the ISO/RTO Council all filed comments supporting the NOPR. NERC Files TOP/IRO Quarterly Status Report - April 1 - NERC filed its first quarterly status report regarding the status of revisions to the Transmission Operations (TOP) and Interconnection Reliability Operations and Coordination (IRO) Reliability Standards. After FERC proposed to remand two NERC petitions for approval of TOP and IRO standards for failure to address certain critical reliability aspects included in the current standards, NERC committed to review the standards in light of FERC's concerns and to file quarterly reports on the status of resulting revisions. NERC Concludes System Operating Limits Investigation April 1 - NERC filed a report with FERC concluding its investigation into whether WECC and the Los Angeles Department of Water and Power had violated System Operating Limits (SOL). PacifiCorp had initiated the investigation in late 2012. NERC's compliance investigation and enforcement teams found no evidence of violations by either WECC or LADWP, and found that the SOLs in question had been properly designed. NERC Proposes Bulk Electric System ("BES") Definition Revisions in NERC Rules of Procedure - April 1 - NERC filed with FERC proposed revisions to the BES definition contained in the NERC Rules of Procedure. The instant filing follows NERC's December 13, 2013 filing seeking approval of the revised BES definition, where NERC indicated that it would subsequently file amendments to its Rules of Procedure to include the new BES definition upon FERC approval. FERC approved NERC's revised BES definition in an Order on March 20, 2014. NERC's proposal aims to revise Appendix 2 and Appendix 5B of NERC's Rules of Procedure to update the definition of BES used in each of those appendices. March NERC Enforcement Filings March 31 - NERC filed three individually docketed enforcement matters and one spreadsheet notice of penalty detailing 18 violations of 8 standards by 6 entities. Additionally, NERC made an errata filing for one of the docketed matters, and FERC declined to further review four February enforcement matters. NERC Submits its Standards Report, Status, and Timetable for Addressing Regulatory Directives - March 31 - NERC submitted its annual report on the status and timetable for addressing FERC's regulatory directives contained in its various reliability orders. In its annual report, NERC has identified 41 FERC directives to be addressed from the 2013 calendar year and 6 issued since March 1, 2014. NERC's stated goal for resolving 90% of FERC's directives issued prior to 2012 by the end of 2015. NERC's filing also includes a detailed table identifying each of FERC's directives it has issued since 2007 and the status of NERC's efforts to address those directives. DOE Issues Cybersecurity Guidance for Energy Secctor Procurements April 28 - The Department of Energy (DOE) announced new guidance, entitled Cybersecurity Procurement Language for Energy Delivery Systems, to help utilities and other energy sector organizations purchase technologies that include cybersecurity protections and features. Developed through a public-private working group, the guidance is designed to provide baseline cybersecurity procurement language for individual components of energy delivery systems (e.g., programmable logic controllers, digital relays, or remote terminal units); individual energy delivery systems (e.g., a SCADA system, EMS, or DCS); and assembled or networked energy delivery systems (e.g., an electrical substation or a natural gas pumping station). Controversy over Physical Grid Security and Sensitive Grid Information Continues - After Senators Lisa Murkowski (R-AK) and Mary Landrieu (D-LA) sent a March 27 letter to DOE's Inspector General (supported by APPA, EEI, and NRECA) requesting an investigation into a leak of certain FERC non-public information about the nation's power grid vulnerabilities to the Wall Street Journal, the Department of Energy (DOE) Inspector General (IG) issued a Management Alert indicating that at least one FERC-created presentation related to grid vulnerabilities was improperly considered unclassified and distributed to employees without proper clearances. The Alert also preliminarily concluded that FERC may not possess adequate controls for identifying and handling classified national security information. Acting Chairman LaFleur issued a statement indicating FERC is cooperating fully with the DOE IG and will implement the IG's recommendations in the Alert to improve information security and limit the improper distribution of classified information at FERC. Subsequently, an April 17 Wall Street Journal article reported criticism of NERC's draft physical security standard as inadequate. The article drew a response from NERC noting that the NERC standards process is subject to FERC oversight and directives and stating that a "one-size-fits-all" approach is not appropriate. Connecticut Public Utilities Regulatory Authority Issues Cybersecurity Report April 14 - Connecticut's Public Utilities Regulatory Authority ("PURA") issued a report entitled "Cybersecurity and Connecticut's Public Utilities." In the report, the PURA highlights activities already undertaken by Connecticut's public utilities to combat cyber attacks and vulnerabilities, as well as provides a number of recommendations for next steps. For example, the report suggests that Connecticut should consider the value of utility-regulated cyber audits and reports, in comparison with a third-party audit system. Additionally, the report emphasizes that Connecticut should be among the states leading the way in addressing cybersecurity issues. DOE Announces New Funding Opportunity for Research Into Energy Infrastructure Cybersecurity April 15 - The Department of Energy (DOE) has announced a new funding opportunity for "research, development and demonstrations leading to next generation tools and technologies that will become widely adopted to enhance and accelerate deployment of cybersecurity capabilities for the U.S energy infrastructure, including cyber secure integration of smart grid technologies." Although only Federally Funded Research and Development Centers (i.e., the National Laboratories) are eligible for the principal award, DOE is encouraging applications that involve collaboration with the private sector, including vendors, utilities, and universities. The full solicitation is available here. DOE IG Report States FERC Protection of Grid Information Insufficient April 9 - After Senators Lisa Murkowski (R-AK) and Mary Landrieu (D-LA) sent a letter to DOE's Inspector General (supported by APPA, EEI, and NRECA) requesting an investigation into a leak of certain FERC non-public information about the nation's power grid vulnerabilities to the Wall Street Journal, the Department of Energy (DOE) Inspector General (IG) issued a Management Alert indicating that at least one FERC-created presentation related to grid vulnerabilities was improperly considered unclassified and distributed to employees without proper clearances. The Alert also preliminarily concluded that FERC may not possess adequate controls for identifying and handling classified national security information. Acting Chairman LaFleur issued a statement indicating FERC is cooperating fully with the DOE IG and will implement the IG's recommendations in the Alert to improve information security and limit the improper distribution of classified information at FERC. EnergySec Launches Incident Response Working Group for Small and Medium-Sized Utilities April 1 - The Energy Sector Security Consortium, Inc. ("EnergySec"), a 501(c)(3) organization formed to support organizations within the energy sector in securing their critical technology infrastructures, recently launched a collaborative working group focused on incident response for small and medium-sized utilities. EnergySec hopes that its series of workshops with help utilities identify, develop, articulate, and share approaches to cyber incidents, particularly for those organizations without cybersecurity teams or with little experience managing modern incidents. Congressmen Introduce Bill to Improve DOD Cybersecurity April 28 – Representative Derek Kilmer (D-WA), along with co-sponsors Gerald Connelly (D-VA) and Niki Tsongas (D-MA) introduced H.R. 4500, "a bill to improve the management of cyber and information technology ranges and facilities of the Department of Defense." The bill would direct the Pentagon's "Principal Cyber Advisor" to establish a comprehensive list of Department of Defence (DOD) cyber and information technology "ranges" and facilities, and would require the Principal Cyber Advisor to determine, on a case-by-case basis, if a listed cyber and information technology range and facility should be centrally managed to increase efficiency. According to a press release from the bill's sponsors, "[c]yber ranges are networks used by DOD military, civilian, and contractor personnel for a variety of initiatives – including training for combat situations and research and development for technological breakthroughs." The bill would also require the Secretary of Defense to establish a new entity or designate an existing one within DOD to coordinate cyber and information technology ranges and facilities that the Principal Cyber Advisor determines should be centrally managed. Senate Energy & Natural Resources Committee Hearing on Grid Security and Reliability April 10 - Sen. Mary Landrieu convened her first FERC-related oversight hearing as Chair of the Senate Energy & Natural Resources Committee. The hearing, entitled Keeping the lights on — Are we doing enough to ensure the reliability and security of the US electric grid? drew a standing room crowd to hear testimony from two FERC Commissioners, the NERC CEO, and representatives from state regulators, industry, trade associations, labor, and the environmental community. The hearing covered two major topics: (1) physical and cyber security issues involving the bulk power system and (2) economic and regulatory concerns about the reliability of the generation supply in wholesale electric markets. Chairman Landrieu won praise from both sides of the aisle for quickly convening a timely and important hearing. SPP to Hold CIP Week in June - On June 2-5, SPP will hold its 2014 CIP Week, which will include a meeting of the CIP Working Group, a training on CIP V5, a CIP workshop, and an RTO compliance forum. Several Regional Entities Post 2015 Business Plans and Budgets - Several regional entities posted their 2015 Business Plans and Budgets for review and comment on their websites, including ReliabilityFirst, SERC, WECC, and Peak Reliability. The deadlines for submitting comments are as follows: ReliabilityFirst - May 31st; SERC - May 31st; WECC - May 16th; and Peak Reliability - May 19th. SERC and RFC Submit Form 715 Filings - SERC and ReliabilityFirst Corporation (RFC) submitted Form 715 filings to FERC detailing anticipated system transmission performance, base case power flow information and other information related to the operation of their high voltage transmission systems. NIST Releases Draft Smart Grid Interoperability Standards - April 14 - The National Institute of Standards and Technology (NIST) seeks comments on the draft NIST Framework and Roadmap for Smart Grid Interoperability Standards, Release 3.0. Release 3.0 builds upon Release 2.0, issued in February 2012, and includes a description of the Smart Grid Interoperability Panel (SGIP); updated architecture, cybersecurity, and testing and certification chapters; and a new chapter on cross-cutting issues and future directions. Comments are due May 30, 2014.